Who doesn't like carrot cake? Put that goodness in a pancake, and let's just say....you won't have leftovers. Carrot cake is my husband's favorite, and it's not too far down my list as well. As long as it doesn't have any nuts in it. My opinion....why ruin a yummy, moist cake with lumpy nuts! I thought...why not make it into pancakes. Apparently, I was not the first person with this idea. I searched online and took my favorite parts from different recipes I found, and then made it gluten-free. We are huge fans of pancakes in our house and it is our Sunday tradition. 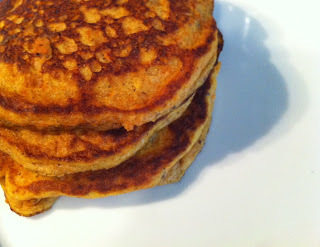 From eggnog pancakes, to pumpkin pancakes, to oatmeal pancakes, to a family-sized baked apple pancake. So much creativity can be done with these small fluffy circles of goodness. Gluten-free be d*mned.....these pancakes won't have you missing a thing, and I bet if you served them to someone who was not gluten-free, they would not know what was missing...go on, I dare you! These pancakes are pretty quick to whip up, and don't require any sitting time (like the oatmeal pancakes). And for the literal icing on the cake, try some mascarpone topping instead of regular ol' syrup. If you don't have carrots, this recipe works just as well with zucchini. Ladle 1/4-cupfuls on the greased griddle until done like you like them. While you are cooking batches, warm the pancakes in the heated oven on an oven-proof plate or baking dish. Mix the above in a small mixing bowl until well blended, and viola! Put a couple of tablespoons on your stack of pancakes and enjoy!